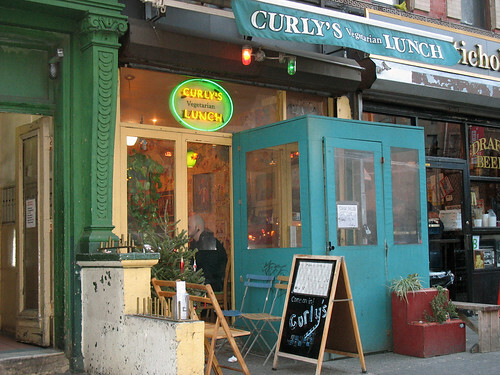 I’ve walked by Curly’s hundreds of times, but was always on my way to eat somewhere else, or had just finished a meal at another restaurant. So in the midst of holiday shopping, I took a break to grab a burger for lunch here. Inside is warm, colorful, and cozy – so cozy that I had to wait a few minutes for a table to empty up, even though it was a bit late in the afternoon for lunch. 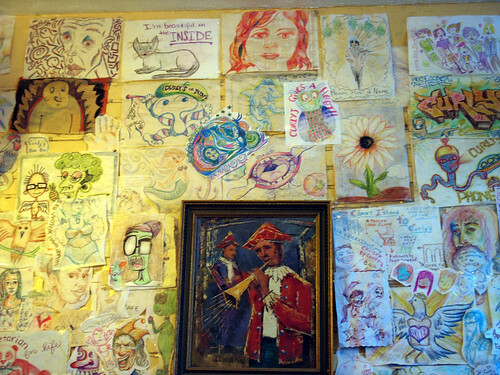 While I waited I looked at the crayon drawings customers have done on placemats, now taped to the walls as decoration. Once I was seated, I looked over the menu and tried to decide which of the nine burger options I wanted to try. I love having so many options! I settled on the bacon and cheddar burger (the menu states that “we’ll make any item vegan if you ask! Vegan cheese +.75”). 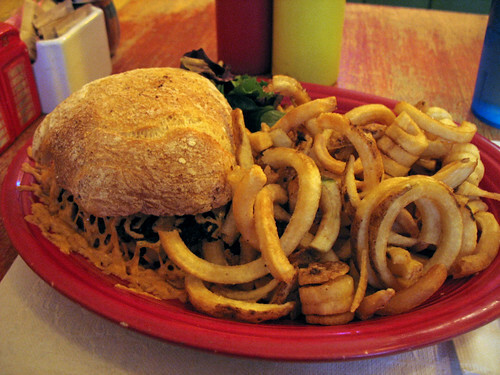 My plate arrived loaded with curly fries, of course! Look at that melty vegan cheese… pretty sure it was Daiya, although the menu did not specify. Quite tasty. Even though I’ve gotten used to eating burgers without cheese, it was a nice change of pace to indulge in on a cold, winter day. 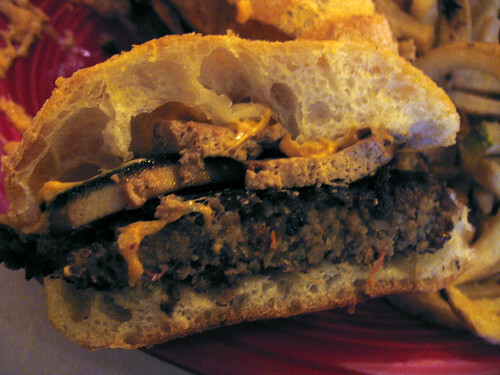 The burger was deliciously crispy on the outside, and wonderfully hearty and nutty on the inside. The menu explains that the patty consists of “soy protein, black beans, seeds, vegetables, onion, and garlic”. I wish all “diner food” tasted so good! 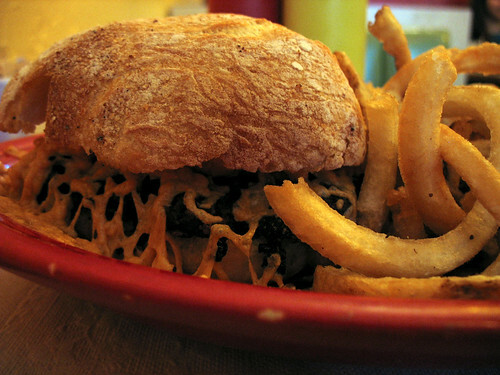 The bun was perfect – sweet and soft, just the right size and texture for a burger. I was disappointed by the vegan bacon though – I was expecting something crispy, like tempeh bacon… but this was just slabs of too-salty tofu. Too soft, and more salty than smokey or bacon-flavored. I’m really not a huge fan of fake bacon to begin with, but I’ve had some vegetarian sandwiches where a crispy, smokey substitute really complemented the other flavors well. This burger was not one of those, unfortunately. I ended up pulling it off and taking the greens that were served on the side and eating the rest of the burger with them in place of the bacon. Aside from that though, it was definitely a quality burger. I would certainly return to try the other burger options on the menu… and non-burger options as well. I really wanted to get some dessert, but the burger and fries were so filling that I couldn’t even finish what was on my plate. Oh well, next time!